Feeling brave? 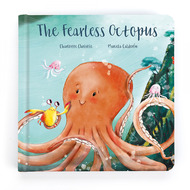 Open up The Fearless Octopus Book! This beautifully written poetic story follows a very courageous octopus! Adventuring can be scary - face those fear with our wriggly hero! A hardback book with gorgeous illustrations, it's a brilliant gift to inspire little readers.